Cities are complex and fast changing organisms, especially in low- and middle-income countries where rapid population growth, urbanization and technological advances are creating a dynamic mix of opportunity and challenge. One major issue facing many cities is road safety. On one hand, fleets of cars and motorcycles are growing rapidly, increasing risks to pedestrians and drivers as they overwhelm infrastructure and policy. Take a city such as Bogotá, where every year approximately 500 people lose their lives on the roads and thousands more are seriously injured; the majority, 89 percent, are people walking, bicycling or riding motorcycles. These approaches can now be informed by an explosion in data on how people travel around cities, thanks to the advent of mobile phones and accompanying apps for mapping, ride-sharing, ride-hailing, planning public transport trips or any app that provides location-based services. The data generated could guide decisions in a more precise, timely and cost-efficient manner. But much of it is gathered by private companies that are constrained by privacy and business concerns, both in terms of releasing the personal information of customers and commercially sensitive data. Furthermore, the massive amount of data available must be proactively gathered and synthesized to actually be useful to policymakers. In response to this, WRI recently helped launch Open Traffic, an initiative of the Open Transport Partnership that aims to help improve transport planning, traffic management and safety by facilitating the delivery of detailed traffic data to cities. The partnership, led by the World Bank, along with its founding partners Mapzen, the National Association of City Transport Officials (NACTO) and WRI, will enable leaders to make informed, targeted decisions about sustainable urban mobility and road safety and monitor the impact of these decisions, potentially saving thousands of lives and improving productivity too. The first iteration of the partnership focuses on one of the most fundamental problems: speed. The speed limit in Bogotá is 80 kilometers per hour (50 mph). In reality, however, the city moves at an average speed of 20km/h during the day. A disproportionate number of fatal crashes occur at night when vehicles are able to travel at higher speeds due to free flow conditions. According to the UN, speed contributes to between one third and one half of fatal collisions globally – higher speeds allow lower response times and people simply can’t withstand the physical forces of high speed collisions. Studies have shown that lower speed limits can actually help ease congestion in addition to improving safety. This was the case in Sao Paulo in 2016, when lower speed limits on major urban roads reduced congestion by 10 percent as well as reducing fatalities by 29 percent. However, speed reduction proposals are often met with resistance and skepticism. Will congestion worsen? Will trips take longer? To make things more difficult, cities often don’t have information about which streets have the highest increases in speeds, which would help make more targeted interventions. As part of the Open Traffic initiative, city governments will have access to a platform that will help them answer these questions and gauge the benefits of policy changes like reducing speed limits from 80 km/h to 50 km/h. This has been possible through Open Traffic’s data agreements with ride-hailing companies, fleet companies and other consumer apps which makes it possible to anonymize and aggregate their raw GPS data, converting them into real-time and historical traffic information. A global data platform of traffic speeds linked to OpenStreetMap road segments is already under development. This same data will also be accessible to the public under an open data license. The current data partners are Easy Taxi, Grab , Le Taxi, NDrive and Miovision. Thanks to these companies, Open Traffic provides access to data for more than 500 cities all over the world. Open Traffic will offer cities the opportunity to understand and measure the impacts of road safety interventions on safety and traffic flow. This applies both to identifying risks, such as dangerous speeds and the types of roads that encourage these, and measuring the impacts of traffic safety improvements, such as a street redesign or lowered speed limits. Furthermore, it will empower cities to study the impacts of traffic safety interventions in a fraction of the time and cost previously required. 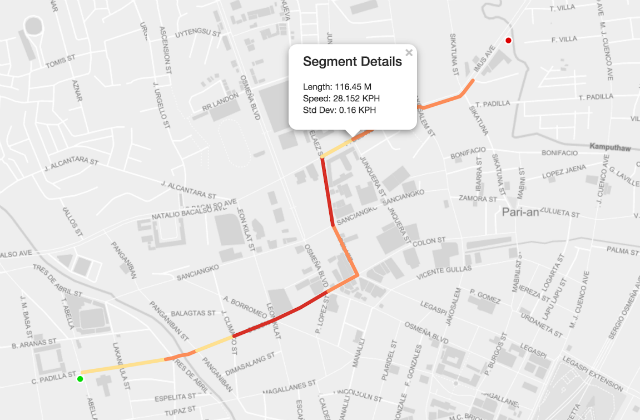 The data generated by Open Traffic will provide the opportunity to identify high speed areas to target, quickly establish a baseline, and review impacts of speed reduction, almost in real time. Most importantly, it will allow decision-makers to convey messages about the benefits of these interventions in a clear and transparent way. Open Traffic was piloted in the city of Cebu in the Philippines in 2016, where municipal authorities were able to apply the data to adjust traffic light phasing. Initial studies showed that while a traditional traffic analysis process could take weeks of planning and cost up to $55,000, with Open Traffic a single person could generate more robust information almost instantly. Since its launch in December 2016, the Open Transport Partnership has been seeking to secure partnerships with other data partners to make the platform truly global and to start generating new types of data, which will further aid city policymakers in improving safety and equality, and reducing emissions and congestion. The data will consider elements such as curb space utilization, lane space, parking inventory and trip-level data, among others. As well, as data is continually gathered over time, it becomes cumulatively more reliable; patterns by times of day, week and year will be better understood and visualized by the platform. In Bogotá, where plans are currently underway to introduce low-speed zones of 30km/h and below by setting speed limits and redesigning streets, access to data provided through the Open Transport Partnership will enhance the city’s ability to refine these projects, and identify and communicate positive outcomes to citizens. The subsequent road safety changes will benefit everyone, but especially the majority who walk, bicycle and ride motorbikes. Anna Bray Sharpin is a Transportation Associate; Claudia Adriazola-Steil is the Health and Road Safety Program Director; and Diego Canales is a Tools and Data Innovation Associate at WRI Ross Center for Sustainable Cities.